Miami Trace senior Samantha Ritenour (33) puts up a shot while guarded by Washington freshman Rayana Burns (left) and senior Savannah Wallace during a Division II Sectional semifinal game at Adena High School Thursday, Feb. 16, 2017. Washington senior Savannah Wallace (10) puts up a shot over Miami Trace junior Tanner Bryant during a Division II Sectional semifinal game played Thursday, Feb. 16, 2017 at Adena High School. FRANKFORT — The Miami Trace Lady Panthers squared off against the Washington Lady Blue Lions in the Division II Sectional semifinals Thursday at Adena High School. It was the third meeting of the season for the two Fayette County and SCOL rivals and the second time they had played each other in five days. Miami Trace won the game, 53-34 to advance to Saturday’s Sectional championship game against Unioto. The Lady Shermans beat Waverly in Thursday’s second game, 56-44. Miami Trace (now 19-4 overall) had four players in double figures, led by senior Samantha Ritenour and junior Victoria Fliehman, each with 13 points. Senior Hanna Reisinger and junior Tanner Bryant both scored 11 points. For the Lady Lions (ending the season at 11-12) sophomore Hannah Haithcock was the game’s leading scorer with 14 points. Freshman Rayana Burns added 11 points. “I thought their defensive energy early was very good,” Miami Trace head coach Ben Ackley said of the Lady Lions. “I thought that was as hard as I’ve seen them play on defense all year. They challenged us and took us out of some things we wanted to do. “We didn’t execute as well as we wanted to early,” Ackley said. “I thought our second and third quarters were very good. I thought we had good minutes from our bench. That really allowed us to get kids some rest. We’ve had a couple of kids sick, so, I thought it was key to get them more rest than normal with the quick turnaround on Saturday. 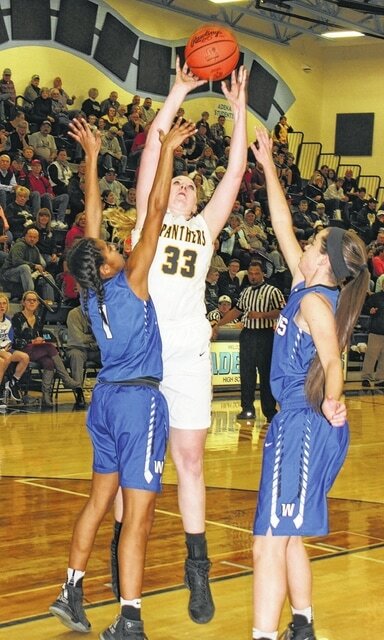 “I thought our girls came out and were ready to go from the start,” Washington head coach Samantha Leach said. “They played extremely well in the first quarter. In the second quarter, I had two starters on the bench in foul trouble. “My kids played hard,” Leach said. “Something we’ve talked about is, we have to learn how to play smarter. Trace is a very good team. They play hard and they play smart. Washington led Miami Trace by three points three different times in the first quarter. At the end of eight minutes of action, Washington led Miami Trace, 13-12. The lead changed hands five times in the second quarter. Washington’s final lead of the game was 20-19 on a basket by Haithcock with roughly five minutes to play in the second quarter. From that point, Miami Trace went on a 13-1 run, punctuated by a three-point field goal from just inside the half-court line at the buzzer from Bryant to give the Lady Panthers a 32-21 lead. The third quarter was particularly unkind to Washington as Miami Trace outscored the Lady Lions, 13-3. Haithcock was often double or triple teamed in the low post. Washington tried to take shots from the perimeter, but the Lady Panthers played stifling defense, limiting the Lady Lions’ chances. Bre Taylor hit Washington’s first and only basket of the third quarter, a three, with 51 seconds to play in the quarter. Miami Trace held a 45-24 lead after three. Turnovers and steals were a big part of the game. Washington turned the ball over 29 times. Miami Trace had 14 steals and turned several of those into points on the offensive end. After a free throw by Miami Trace to start the fourth quarter, Washington went on a 9-0 run, their best stretch of the game with two points from Haithcock and seven from Burns. Ritenour scored the next six points for Miami Trace on the way to closing out the 53-34 victory. Tickets for the Miami Trace girls Sectional championship basketball game will be on sale from 9 a.m. until 3 p.m. in the main office at the high school today. Tickets are $5 each. Miami Trace will play at 2:45 p.m. on Saturday at Adena High School for a Sectional championship. Miami Trace boys basketball Sectional tickets will be on sale beginning Tuesday, Feb. 21 in the high school’s Main Office. Tickets will be on sale from 9 a.m until 3 p.m. All tickets are $5. The boys play at 7 p.m. on Saturday, Feb. 25 at Ross Southeastern H.S. 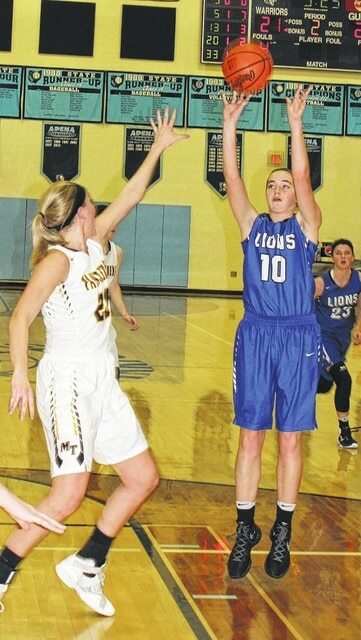 The Washington Blue Lions will play the Circleville Tigers in the Division II Sectional tournament Tuesday, Feb. 21 at 6:15 p.m. at Southeastern High school. Tickets are $5 and are currently on sale at the high school office today until 3 p.m. and Monday and Tuesday from 8 a.m. until 3 p.m. The school receives 25 percent of the proceeds of the pre-sale tickets sold. MIAMI TRACE — Olivia Wolffe 0-0-0; Cassidy Lovett 0-0-0; Becca Ratliff 0-0-0; Hanna Reisinger 3 (1)-2-11; Shaylee McDonald 1 (1)-0-5; Morgan Miller 0-0-0; Victoria Fliehman 2 (1)-6-13; Tanner Bryant 3 (1)-2-11; Tori Evans 0-0-0; Samantha Ritenour 5-3-13; Tori Riley 0-0-0. TOTALS — 14 (4)-13-53. Free throw shooting: 13 of 17 for 76 percent. Three-point field goals: Reisinger, McDonald, Fliehman, Bryant. Combined field goal shooting: 18 of 49 for 37 percent. Three-point field goal shooting: 4 of 12 for 33 percent. Turnovers: 16. Rebounds: 30 (10 offensive). Assists: 7. Steals: 14. WASHINGTON — Rayana Burns 4 (1)-0-11; Maddy Garrison 0-0-0; Bre Taylor 0 (1)-0-3; Kassidy Hines 0-1-1; Savannah Wallace 0 (1)-0-3; Savanna Davis 0-0-0; Tabby Woods 1-0-2; Shawna Conger 0-0-0; Maddy Jenkins 0-0-0; Hannah Haithcock 5 (1)-1-14; Halli Wall 0-0-0. TOTALS — 10 (4)-2-34. Free throw shooting: 2 of 6 for 33 percent. Three-point field goals: Burns, Taylor, Wallace, Haithcock. Combined field goal shooting: 14 of 34 for 41 percent. Three-point field goal shooting: 4 of 9 for 44 percent. Turnovers: 29. Offensive rebounds: 3.